How Do I Restrict My Family Information in the Online Directory? You can hide your address, phone numbers, and emails and display only the items you want to share. This directory is not available to the general public. It is only available to authorized members of our website, which means only current PTA members who are Puesta del Sol families or school staff. A PTA website administrator must personally authorize each individual who has an account on our website in order to establish permissions for that person to view the online directory. The list of individuals is cross-checked with PTA membership purchases and with school records at the start of each school year. The directory search page looks like this. Here is what it looks like when you search for your own account. 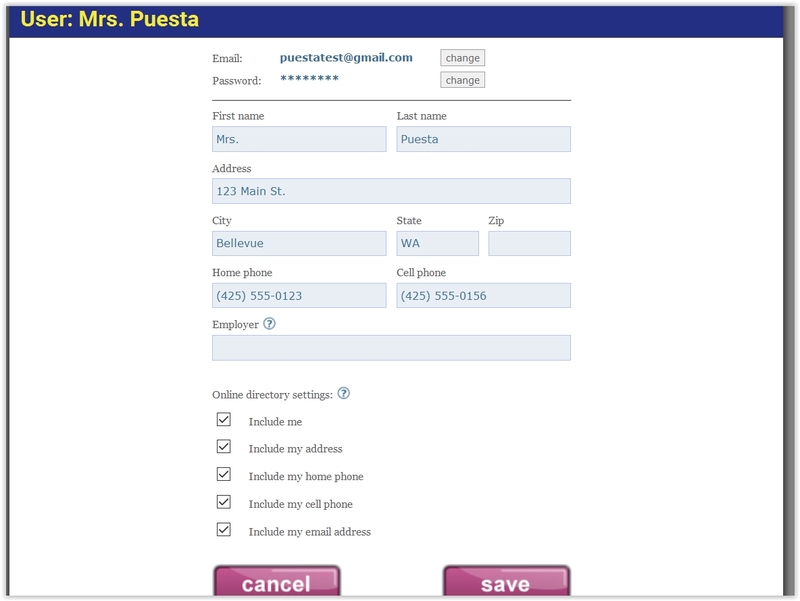 In the example below you can see that Mrs. Puesta's email and Mr. Puesta's phone number have been protected. Any item that has an "eye" icon next to it is visible and can be hidden from the search results by simply clicking on the "eye". Here is what it looks like when someone else searches for the Puesta family. Her email and his cell phone numbers are hidden. Click on "My Account" on the side menu. Select the edit icon next to your name or the family member you wish to edit. Then change the options by checking or unchecking the boxes for displaying information. If you do not want to be included in the online directory, you can uncheck the box to "Include me" under the Online directory settings section when editing your account (see above instruction). If you want to be included in the searchable online directory and simply want to limit your information, you can uncheck any boxes as needed to hide the information you wish to keep private. Please email the PTA Webmaster at webmaster@puestadelsolpta.org if you have any difficulty opting out of the online directory. Go to the Directory page on the website at http://puestadelsolpta.org/directory. Enter your name in the Search box and search for your family. Just click on the little "eye" icon next to each element that you would like to hide. If there is an "eye" next to an item then it is visible to other authorized users of the website; if there is an empty white box then it is hidden. To edit your information (e.g. change address, email, phone numbers, spouse, children), go to the "My Account" page at http://puestadelsolpta.org/Account. If you have any questions about how to restrict your information, please contact the webmaster.